Michael Jackson is back. This is it. Obviously, he hasn't actually returned from his final resting place (although that would make for an interesting movie). 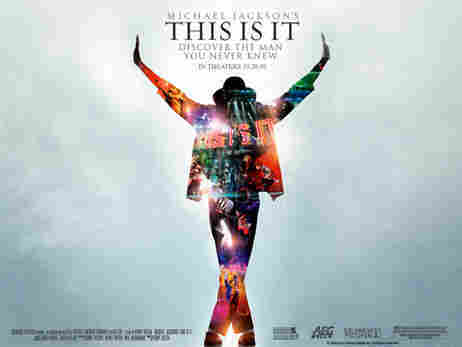 This Is It is the title of the newly-released film that chronicles the "King of Pop" during a three-month period leading up to his sudden death on June 25 at age 50. The film boasts rare, behind-the-scenes footage of Jackson as he rehearsed for his world comeback tour that was also titled, strangely enough, This Is It. The film's footage was originally compiled during the dress rehearsals for the tour. The concert series, which would have been underway now, was meant to be Jackson's final comeback. Now, the tour footage serves only as a memorial to the moon-walking, crotch-grabbing legend. And, of course, it will also help to answer those questions about whether Michael Jackson still "had it" -- as in dance moves -- at age 50. What do YOU make of all the hoopla surrounding this release? Is it a fitting tribute? Or, is all of this a bit over-the-top for the dearly departed? Tune in tomorrow. Tell Me More discusses This Is It.